There’s nothing wrong with vanilla ice cream. FoxSports is serving it for the NLCS broadcast. I tried ESPN radio, too. I yearn for something more distinctive: a broadcaster who thrives on baseball. I’ve been thinking about Harry Kalas and Richie Ashburn. I never heard the pair together. But I heard Harry The K recall his long-time broadcast cohort. Before accepting the Hall of Fame’s Ford Frick Award in 2002, Kalas talked about his Phillies memories. “Thanks for your kind letter. The Cooperstown weekend is something I will never forget. Richie was as good a friend as a man could have. Not a game goes by that something will happen on the field that reminds me of ‘His Whitness’ and it’s always with a smile on my face and warmth in my heart. 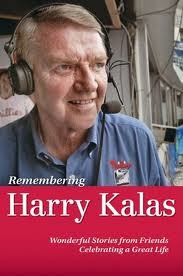 Not to slight Giants fans…but Phillies followers might want to follow this Harry Kalas Facebook page. Too bad you didn't hear Richie and Harry together. I listened to Phillies' games on the radio back in the 1970s, and they were a great pair. Another great radio pair was Marty Brennaman and Joe Nuxhall with the Reds on WLW. Joe passed away a few years ago, but Marty is still going strong. Thanks, Kregg! Good broadcast teams are like any good teams. Relationships make them work.